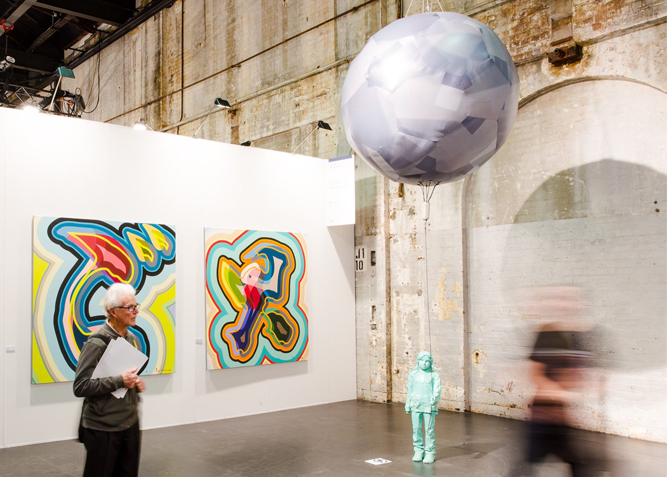 Curated by Chief Curator at the Museum of Contemporary Art Australia Rachel Kent and Assistant Curator Megan Robson, Installation Contemporary presents an exhibition of innovative, site-specific and interactive installations ranging from the minute to the monumental throughout the Carriageworks precinct. 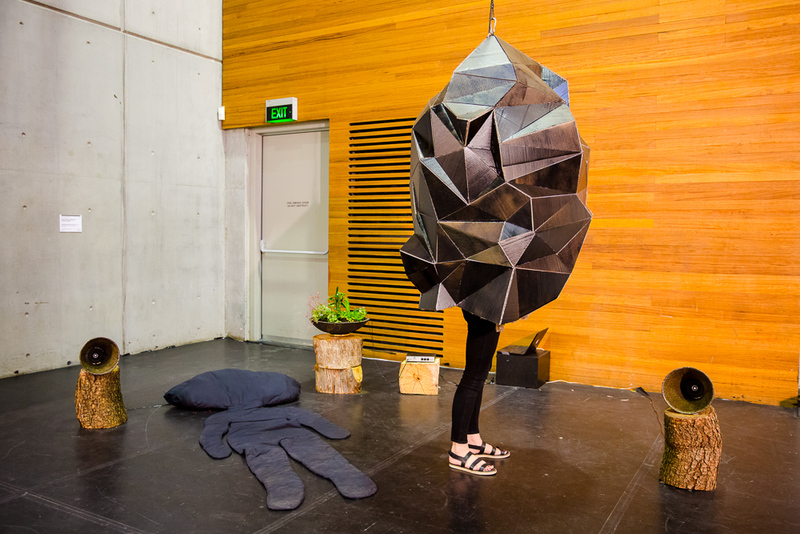 Breaking out of the confines of the booth, the 2015 Installation Contemporary Program (curated by The Curators' Department - Glenn Barkley, Ivan Muñiz Reed and Holly Williams) presented more than a dozen innovative, site-specific and interactive works throughout Carriageworks. 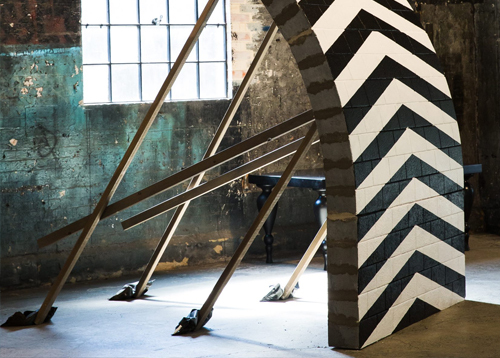 'Characterised by its towering heights and hidden corners, the evocative spaces of Carriageworks provided an ideal location for the immersive, interactive and site-specific artworks that form Installation Contemporary. Ranging from the minute to the monumental, this project by The Curators’ Department brings together 18 engaging works by Australian and international artists. About ten years ago I picked up a book on Gaudi and was amazed by his work, the way he took iconography, styles, technique, materials and technology from everywhere from the far east to ancient Greece and created these beautiful buildings that resonate with life yet also have a timeless quality. I try to work in a similarly intuitive way. The merging of these materials (concrete, terracotta, wood, 24ct gold leaf) came about in a similar way to if you were building a house. In some ways I see these sculptures as architectural projects with their concrete foundations, timber floor, golden walls and terracotta roof. When I made this group of sculptures, I started by modelling a section in clay. I might come across something that interests me, like a pinecone, a decorative detail on a building. Or it might be a particular section of a sculpture, like a log that’s been carved in marble. I like those crossovers of materials; it reminds me of a game of Chinese Whispers and how the original message gets changed. When presented with new ideas or images, our first reaction is to decide and declare how we feel about them, even before we fully untangle them in our minds. Over the last few years I’ve become fascinated by the overuse and finality of adjectives. The lack of meaningful critique and thinking in our everyday lives seems like a direct consequence of a culture that intuitively swipes to answer and constantly asks what’s next? In this work, I have tried to make something that rewards close attention. Made with paper, the process involved thinking about how this commonly available material, could be used in a completely new way. Thousands of hand cut and curled paper strips were joined together and glued down to form this paper tapestry. This work is rich in texture, shadows and visual energy that slows the eye down, encouraging the mind to linger and think about the work in front of it rather than instantly declare an adjective and swipe for next. Justine Khamara has amassed an archive of digital files on her computer that she has been working with for a number of years now. These files contain information that can be materialised into photographs that depict the likenesses of her family, whose warm flesh and blood features are continually changing, weathered by time’s relentless march forward. The constants in Khamara’s work over the years has been this slowly growing archive of photographic portraits, and the cut. 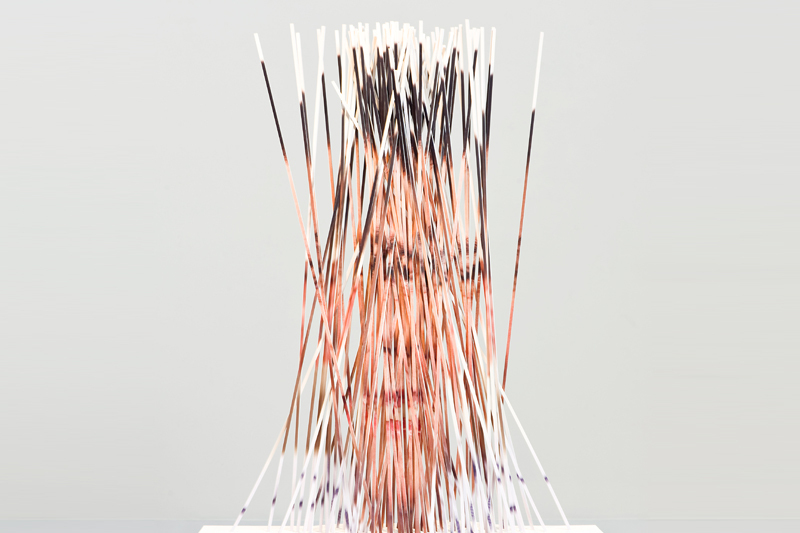 Each work begins with a cut, either the cut of a scalpel blade or a laser beam. “When I cut my photographs, I atomise them into parts, sometimes only one or two, at other times hundreds or even thousands.” These photographic parts—printed sometimes on paper, and at other times on wood, cloth or steel—are then reconfigured creating works that are haunted by the human figure, a presence that can oscillate between complete realisation and total annihilation. Faces emerge and implode, shattering into pieces that can be regrouped as fully three-dimensional objects; objects that can balance themselves on geometric shapes—ideal forms—or simply stand on the gallery floor. In others, more recently, form and photograph come together as collage. Someone Else’s Problem is an extension of Alex Seton’s body of work which explores the issue of asylum seekers. The installation is a mass of seemingly discarded paddles that signify the many people currently seeking refuge from persecution or fleeing war torn regions around the globe. The work proposes that under ‘Operation Sovereign Borders’ Australia renders the current international refugee crisis as ‘someone else’s problem’. In turning away and denying the rights of these individuals, Australia ignores its obligations to international treaties on Human Rights. The labeling of asylum seekers as ‘illegals’ is not only fundamentally false, but also dehumanises the issue, compounding the problem of alienation. Someone Else’s Problem seeks to remind the audience how lucky few are to enjoy lives of peaceful opportunities in one’s homeland. The paddle, a symbol of assistance, asks how can those asking for help be ignored when the privileged have so much to spare? Mylyn Nguyen’s work explores childhood memories. 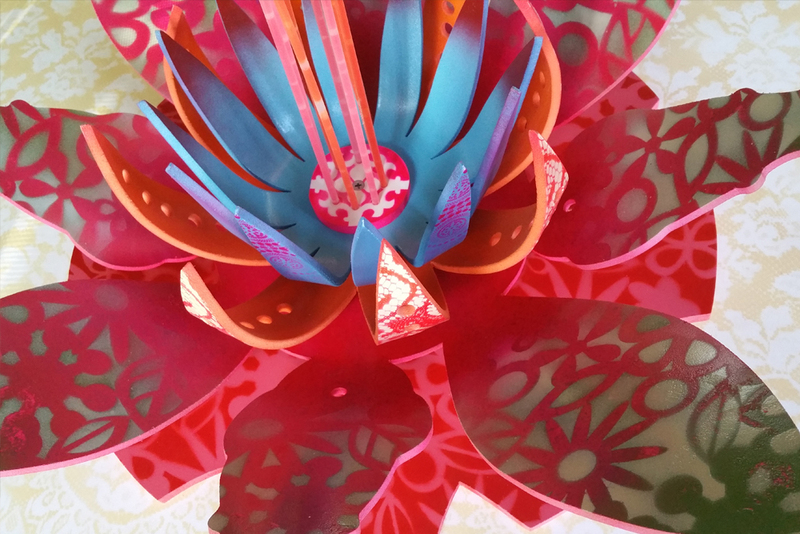 She has created many comprehensive bodies of work, showing internationally at Art Stage, Singapore with Brenda May Gallery, as well as smaller projects, varying in appearance, approach and materials. ‘Bombus’ an installation of 1,000 intricately handmade bees, followed on from Nguyen’s ‘Daddy Long Legs’ series, featuring life-like, spindly-legged spiders made out of paper, captured in an assortment of found glass vessels. Previously Nguyen has manipulated her own hair to form birds around blown glass orbs containing black silhouetted landscapes and whittled tiny worlds into commonplace household furniture. 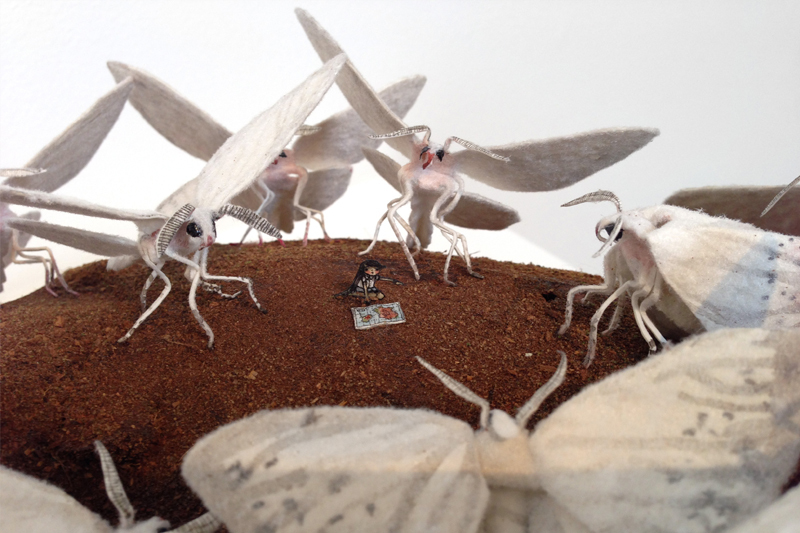 She has also carved sugar cubes and molded fairy floss to form miniature scenes and cloud-like snails. In 2014, Nguyen created a series of polymer clay schoolgirls with long dark hair that morphed into various animals; eerie human-faced birds also shaped from hair, nestled in dried organic matter; and 115 intricate paper bugs carting their own peculiar burdens crawled up the walls of Brenda May Gallery. Helen Eager has always loved drawing and this has been a foundation of her work. Eager has made drawings on glass before with marker pens, but this new work will use translucent coloured tape for the first time. The tape gives a clear and defined line, very much in keeping with Eager’s new work. It reacts to the light conditions and can appear as a strong solid, a translucent glow and even a dark silhouette. Whilst Eager has made large-scale wall drawings before, this is also the first time her installation has spread to multiple planes throughout a venue. The drawings can be seen to float on the glass, collide with the scene behind or interfere with the viewer’s reflection. In the shifting light of Carriageworks, the drawing will be activated by the elements, as well as the changing perspective of the viewer. First exhibited at the 2013 Venice Biennale, Scott Eady’s Calciami! enlists nine candy-coloured bronze globules to tempt audience engagement. The playful, tongue-and-cheek nature of Calciami! “usurps the power and presence of serious monumental sculptural form to enhance various sight-gags and tricks made at the expense of the audience. Eady reinvigorates sculptural object-ness through games, tricks, and other acts which operate somewhere in the realm between object, space and audience. The medium’s core values of making, materiality and encounter are constantly reinscribed, while being turned into a game or a joke that undercuts its more heroic or macho tendencies.” (Aaron Lister, 2013). 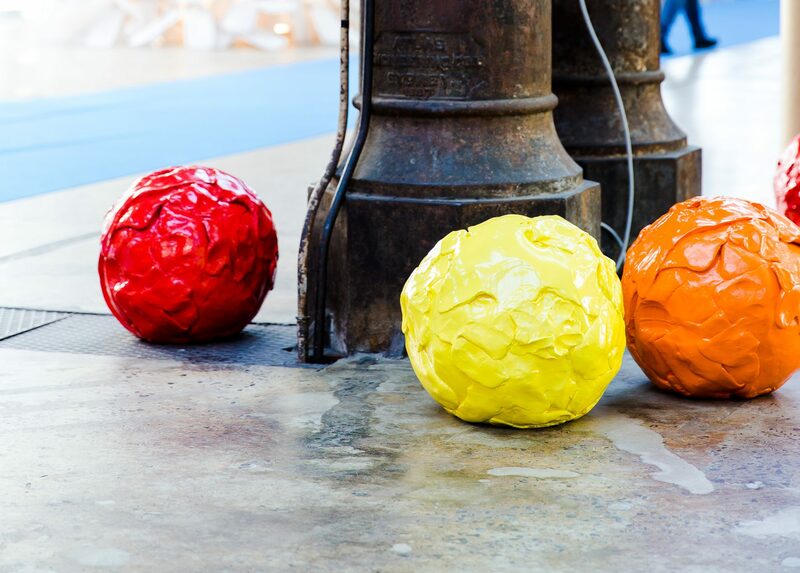 Lured by their bright, glossy exterior, the viewer is invited to connect with each ball through Post It note-style messages such as “Kick me;” potentially disastrous actions when considering the heft of the bronze forms. Through the series of works Eady demonstrate his sardonic wit; with his “increasing emphasis on sculpture as prank,” (Aaron, 2013) Eady makes disruptive and troublesome sculpture that interrogates and confounds expectations of the medium. The artist acknowledges and thanks Rebecca Hamid at RH Gallery and the Otago Polytechnic for their support of the work at Venice Biennale 2013. As autumn turns to winter and the temperature drops it is time to order fire wood. Each piece of wood is handled many times: cut to length, split, loaded into the truck, unloaded, loaded into the wheelbarrow, carried into the house, burned and the ash spread on the garden. Many times I have picked up a piece of fire wood and seeing that there was an interesting grain hidden by the rough split surface, I thought ‘I’ll save that one, make something’ only later to throw it on the fire. 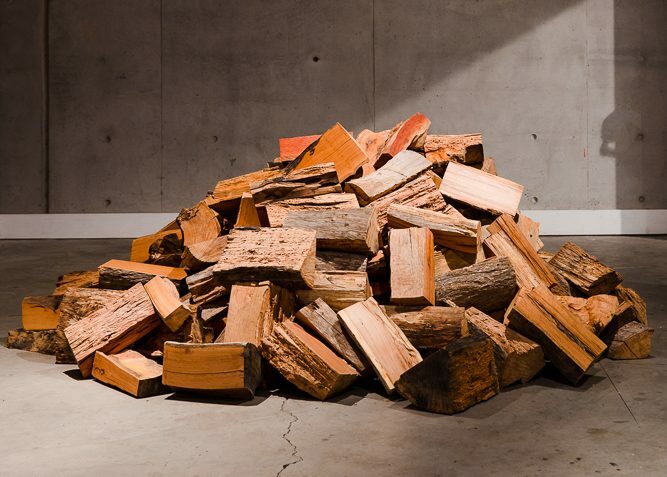 In Firewood: One tonne each piece of unremarkable wood has one dressed face revealing a window into a complex life. The provision of warmth and cooking heat is at odds with its role of being a home for many. A wood cockroach scurries into the shadow, an ant, a flat bug, and borers create a pile of dust. The sun sets, the wind drops and a winter haze settles over the town. The uncounted cost is a haze of visible and invisible particles and a world that lives within the pile, and the potential of a turned bowl, a fence post or a lining board all up in smoke. A small bronze girl holds her own personal weather station. Weather Makerincorporates a motion sensitive, dazzle-camouflaged, inflatable balloon attached to a stratospheric particle injector (spray can) offering the potential to ‘seed’ clouds, should the need arise for a personal weather modification device in the event of a climate emergency. The wall painting Measure.2 continues Darroch’s characteristic transformative process in paint and sculpture, taking objects far beyond their original context without ever losing their original integrity. This work has been created with the aid of a common vintage measurement tool; a fold out wooden ruler (or box ruler). 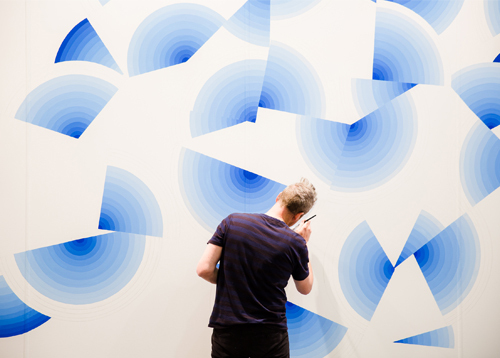 The rhythm of the painting has been created with a restricted palette of gradient blues to strengthen the spatial relationship between the angled and curved forms. Darroch works between painting and sculpture, figuration and abstraction yet with a particularly Australian inflection. He often uses discarded household tools, implements and appliances for works that incorporate elements of colour field painting to reflect the presence of art history in contemporary practice. The concept for Luminous Passage takes its genesis in the earlier works New Works (2013), Pavilion Structure (2014), The Dream House Project (2012) and Archie (2001). These three large scale installations recycled materials, paint and in New Structures recycled neon lights. 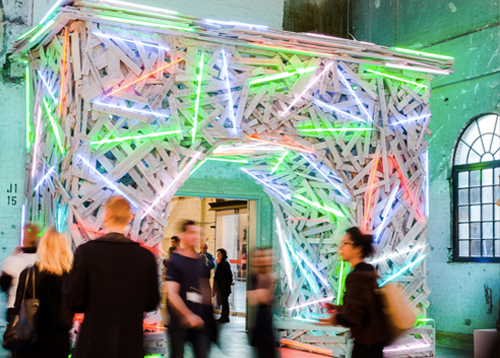 Luminous Passage is a purpose-built wood and neon structure located in main thoroughfare of the fair. By using recycled timber, the majority of which came from demolished leaky homes, Kregar explores the potential use of humble materials to take on architectonic forms. This motivation, as an artistic strategy, can be found throughout the development of installation practices ranging from Kurt Schwitters’ seminal work Merzbau (1933) to the contemporary work of Christo, Tadashi Kawamata, Maya Lin, Sarah Sze or Hector Zamora. Kregar’s work engages with the legacy of such artists by innovatively coupling the grand history of architectural logic with the detested debris of society to cunningly provoke the collective conscience. White cube no longer, Kregar’s structures became spaces of sanctuary, but also functional spaces that visitors could experience as a place to walk through and socialize. These works are an exercise in architectural imagining with tangible application, which reconsiders waste for its real potential of spatial change. Monument #24 presents as a wall, however one that appears to have been compromised with by exterior forces, some natural, some formal. The structure of the wall is exaggerated by the dominant graphic design, creating a kind of dialectic between a robustly physical, three dimensional structure and to superficial graphic elements. Callum Morton’s architecturally themed sculptures and installations offer perceptive insights into the psychological and theatrical aspects inherent to everyday domestic and commercial spaces. Morton’s models of facades, balconies, drive-in cinemas and lobbies manipulate scale and tantalise the viewer. Rather than dryly critiquing urban form, the artist invests his work with personal connections, memory and biographical references, fusing the local with the international. The play of incisive allusions in his work references everything from the gas and fuel buildings from his Melbourne childhood, to AC/DC frontman Bon Scotts rehearsal garage. During his recent travels in South East Asia, including a twelve-month stay in Bali, McGregor has been exploring the conceptual foundations of portraiture, from primitive mark making through to contemporary practice, and the discourses surrounding it. This has enabled him to revisit and rethink his practice while being immersed in various cultural communities. Hayward’s installation I don’t want you to worry about me, I have met some Beautiful People was created during the artist’s residency at the Rita Angus Cottage in 2012. 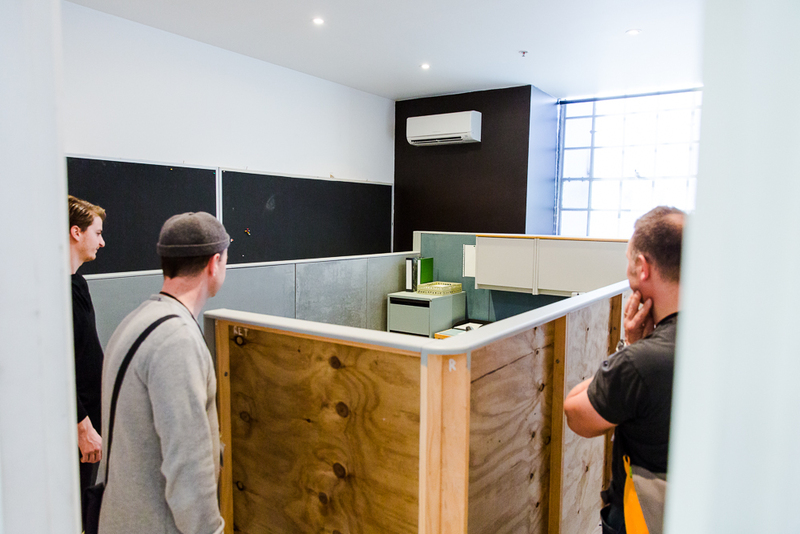 In addition, sculptor Glen Hayward and City Gallery Wellington curator Aaron Lister will have a discussion about Hayward’s installation I don’t want you to worry about me, I have met some Beautiful People as part of SCAF VIP programme. 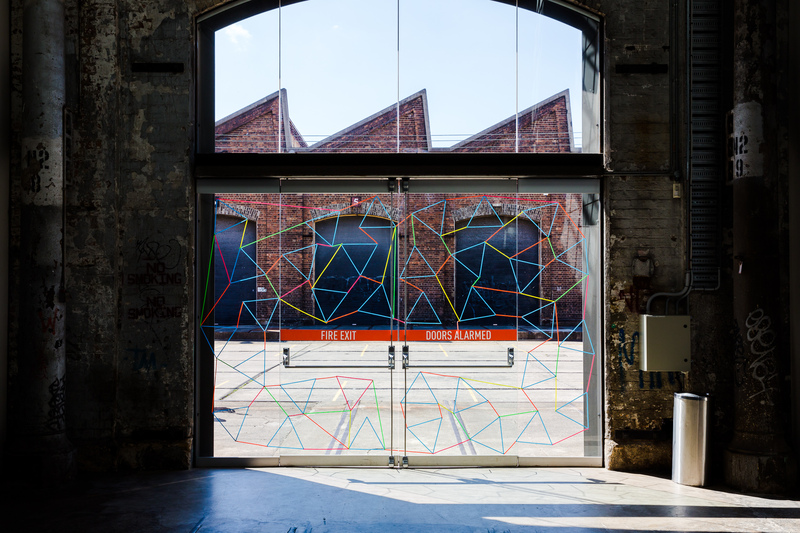 This work responds to the rejuvenation and re-purposing of Sydney Contemporary’s historic Carriageworks venue, which was housed in the old Eveleigh Rail Yards of Redfern from the 1880s until its eventual closure in 1988. Scott Eady provides a droll, thoughtful comment on both the nostalgia of the space’s blue-collar origins and the sense of opportunity that comes at the end of an era – in this case the re-use of the space by contemporary artists. During the 19th century and the early part of the 20th century the rail yards were a hub of industry and employment, as train carriages for Sydney’s expanding rail network were built from scratch and maintained within the building. Roger Merty, owner of local family business Roger’s Shoe Repairs, remembers as recently as the 1960s and 70s when a tram ran down Redfern Street and the factory workers streamed into the area to work: “in the morning you had to push your way through. There were people by the thousands.” It is Merty’s recollections that have inspired Eady’s work, which is an unexpected juxtaposition of a railway worker’s re-soled boots with a large-scale neon sculpture. Through the work Eady seeks to explore sculpture’s ongoing negotiation with its own histories, its contested place in the public realm, and tease out its often tense relationship with audiences. Apa Kausal are words spoken in the traditional Torres Strait dialect of Kala Lagaw Ya, the language of the Western Islanders. When translated into English it means Garden of flowers. Plant life, particularly flowering plants promote serenity, beauty and spiritual wellbeing. For many people, being in nature and interacting with the natural world, brings a sense of peace, tranquility, and feelings of connectedness – with self, others and a higher power. Land cultivation and gardening was one of the pivotal daily activities across the Torres Strait as it provided a staple food source [apart from fish and shellfish] for each community as well as the provision of vibrantly coloured garlands [that grew wild] that adorned feasting tables and mats. One particular flowering plant, the hibiscus was used not only used as adornment but also announced, when worn in the hair by women, if she was married or single. The timber of this bush, especially beach hibiscus was also used for carving. The major amount of available time for individuals was spent in preparing, planting and harvesting gardens in those areas [mainly Eastern and Top Western Islands] where soil was fertile and rain sufficient to ensure growth for most of the year. The coral-sand Central Islands and high rocky Western Islands were less fertile and water was often less plentiful, but island clan groups did have some land under crops, often established on nearby uninhabited islands. Foods often cultivated were bananas, coconuts, cassava, taro and other types of yams. Apart from these, a variety of natural fruits and some wild yams were gathered in the bush, a task carried out by women and children. With the arrival of missionaries came new species of plants and flowers. Frangipanis [considered by Islanders to be a sacred plant] is said to have arrived in Torres Strait via Polynesian peoples who inter-bred with other Melanesian Islander groups. Installation photo by Zan Wimberley. With thanks to Bangarra Dance Theatre. This project has been supported by the Australian Government through the Australia Council for the Arts, its arts funding and advisory body. 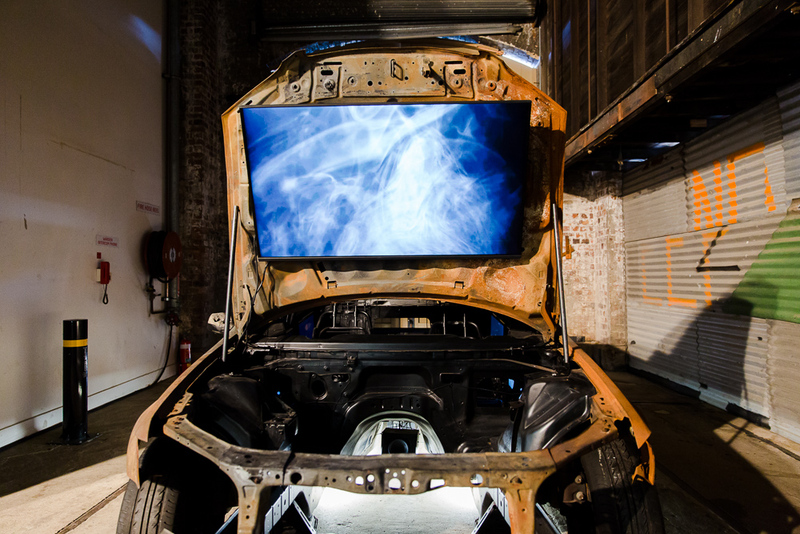 This work was commissioned by Carriageworks for 24 Frames Per Second. Conversations with Plants is a collaborative installation between ceramic artist Simon Reece, music producer Darren Seltmann and artist Vicky Browne.The work uses a sensory plant device purchased from the Italian based Damanhur Community. The device captures the electromagnetic variations of the surface of plant leaves and roots, and turns them into sounds. The plants and speaker system are housed in ceramics made from black Spanish clay and created by Simon Reece (with some input from Vicky) at his Blackheath studio. The ‘sound pod’ is made from fridge boxes and is presented as an alternative space for experiencing the plant music. Rachel Kent is the Chief Curator at the Museum of Contemporary Art Australia. She has presented exhibitions in Australia, New Zealand, Japan and the USA; and speaks and publishes widely on contemporary art and curatorial practice. Recent exhibitions include the survey exhibitions Tatsuo Miyajima: Connect with Everything (2016), Grayson Perry: My Pretty Little Art Career (2015), Annette Messager: motion / emotion (2014) and War Is Over! (if you want it): Yoko Ono (2013). Rachel has worked with leading contemporary artists including Lee Bul, Olafur Eliasson, Tim Hawkinson, Runa Islam, Christian Marclay, Wangechi Mutu, Mike Parr, Ed Ruscha, Tabaimo and Yinka Shonibare MBE. Her Yinka Shonibare MBE survey travelled to the Brooklyn Museum, New York and the National Museum of African Art, Smithsonian Institution, Washington DC (2008–10); and she collaborated with the Musee d’art contemporain de Montreal, Canada on the realisation of Runa Islam’s survey, co-commissioning new work and producing a bilingual monograph (2010). Megan Robson is Assistant Curator at the Museum of Contemporary Art Australia, where she recently curated the exhibitions Primavera at 25: MCA Collection (touring nationally in 2017–18); Martu Art from the Far Western Desert (co-curated with Anna Davis) (2014) and New Acquisitions in Context (co-curated with Anna Davis) (2013). She has worked across a range of notable exhibitions including solo projects with Aleks Danko, Runa Islam, Anish Kapoor, Christian Marclay, Tatsuo Miyajima and Annette Messager; as well as large-scale such as string theory: Focus on contemporary Australian art and Marking Time. Previously she has worked for a number of art organisations in Australia and the UK, including the Barbican Centre, London and the Biennale of Sydney. In 2011, Megan received an Asialink grant to undertake curatorial research in Hong Kong with co-curator Joel Mu. She writes regularly on contemporary art for a range of publications and journals.